MDV-SEIA is pleased to announce that Commissioner McDonald will join us as a Keynote Speaker this year. He will speak on Day 1 of the conference, joining an already exciting line-up, including a Live Energy Gang Podcast. Don’t miss out on the East Coast’s Premier Solar Policy Conference – get your tickets today! 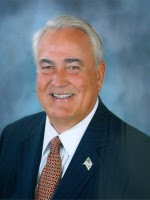 McDonald, who served 20 years as a state Representative, was appointed to the PSC by Governor Zell Miller to fill a vacated post and then re-elected in a special mid-term election in 1998. He held the seat until 2002. On December 2, 2008, Georgians elected McDonald to serve on the PSC again. The voters re-elected him again in November 2014 to another six-year term. McDonald has a deep knowledge of the energy industry. Today he is a member of NARUC’s Electric Committee and where he is Vice-Chair of Nuclear Waste Subcommittee. The Solar Foundation has awarded Georgia Public Service Commissioner Lauren “Bubba” McDonald its 2014 Individual Achievement Award because of his efforts to promote solar energy in Georgia.